Missing the time for your meds due to mobility or dexterity limitations? 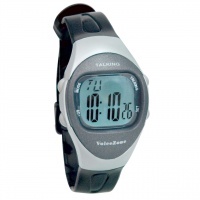 Try one of our reminder watches! Time and date announcement - lets you hear the time as well as date announcement. Four talking alarms - helps remind you of your daily routine. Talking stopwatch with lap - lets you keep track of your time spent on activities and records track time. Hourly time announcement - lets you hear the time every hour, on the hour. 100 year calendar - give you the correct date from 1990 to 2090. Talking functions are read in a clear, female voice. Soft plastic adjustable strap fits practically every size wrist. The large LCD screen is 7/8 wide by 3/4 tall. Watch requires 1 CR2016 battery, included. 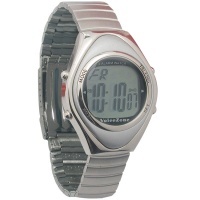 - This watch is equipped with a Power Saving Mode to preserve battery life. In order to use the watch when you first receive it, it may be necessary to turn off Power Saving Mode, a simple process that is done as indicated below. 1. To turn off the Power Saving Mode: Press the Talking button for 3 seconds. This will activate the watch. 2. To turn on the Power Saving Mode (ex. if you don't plan on using it for awhile): Press and hold the Mode & Talking button for 3 seconds. Keep your daily routine running efficiently without ever missing a dose of medicine or missing an important appointment, thanks to the Men's Talking 4-Alarm Medical Watch! This talking medical watch lets you set up to 4 daily talking alarms, or use the talking stopwatch to time and track your activities. The Men's Talking 4-Alarm Medical Watch allows you to see the time and day of the week displayed on the large LCD or hear it announced, and set an hourly chime and time announcement. Great for the Blind and Visually Impaired. Announces time and date. Jumbo 3/4-inch X 3/4-inch LCD with time displayed in large, clear nearly 1/2-inch black digits. Display shows time, day of week, date, year. 4 separate alarm reminders help you remember important things like times to take medication, appointments, etc. 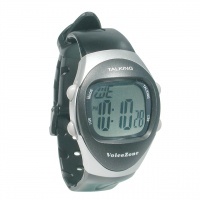 Talking 24-hour stopwatch announces the elapsed time automatically - great for jogging, working out, racing. Also records lap times. Hourly time announcement from 7:00am to 9:00pm. Auto-calendar programmed through the year 2090. Battery: One - CR2016 Lithium cell (included.) Includes Instructions in Spanish Only. 30-Day Warranty. Keep time in style while enjoying the convenience of 4 alarms! 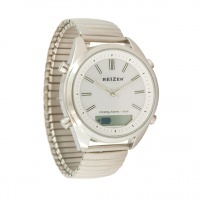 This watch has it all - impeccable classic style, precision engineering, meticulous craftsmanship and more. This watch offers 4 different alarm settings that are ideal for reminding you of events (taking medications, appointments, meetings, etc.) It also makes a great alarm clock to wake you - at home or while traveling - without disturbing others. There is a solar panel underneath the watch dial. Light passes through the dial and is transformed to electric power by the solar panel. The light charges a rechargeable battery that keeps the watch running. It is recommended that the watch should be charged up to once a week in direct sun light or under a strong fluorescent lamp. When using a lamp make sure the watch is approximately 3 inches away from the bulb. Do not overheat the watch as this will cause damage to the watch.